Tribal Museum and Research Centre, Imphal, Manipur- a private museum established in the year 1987 brought out a very popular programme entitled “Know Your Manipur” in the year 1997. 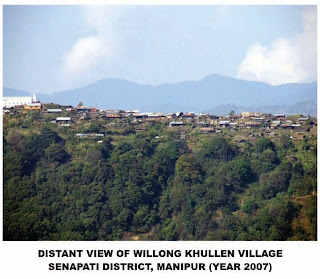 Know Your Manipur' as a programme of study tour, adventure, self-discovery began with a three day tour to Willong Khullen village inhabited by one of the important tribal group of Manipur called Maram. Thirty three members from different academic disciplines participated in the tour. The team carried out visual and textual documentation on ethno-cultural aspects of the tribe and soon after one month, the museum conducted onward tour to Lunghar village inhabited by Tangkhul tribe of Manipur under the second phase of the same series. The visual and textual materials collected during the tour were systematically compiled and the findings were published and a book was released in the September 1997. The book titled Know Your Manipur edited by Salam Rajesh under the Museum Publication was indeed a remarkable achievement of the museum not only in dessiminating the knowledge of indigenous tribal culture but becomes a boon to the so call museum movement. Community involvement in the museum programmes gained a new height in this popular series. In the mean time, the museum came out with a documentary based on the visual collections. 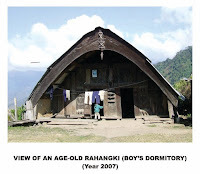 This short film provides an important visual information to peep into the colourful culture and tradition of the Maram and Tangkhul tribe and one can look the life and habitat of these tribal populations for the past decade and above. The programme was instrumental in bridging the cultural relations between different ethnic communities. Venturing the activities of this kind one can definitely feel the sense of communal harmony and respect for other's culture. This I could realise after watching the visuals and reading the book "Know Your Manipur". I had the opportunity to watch the film "Know Your Manipur" at TMRC, Imphal when I visited the museum on my official tour in the year 2005. Watching the film, I was very curious to visit Willong Khullen village and after one year our team visited the village with Sri. Y.Gyaneshwar, Director, TMRC in 2007. This time I could observe a great deal of changes in the village as compare to the visuals that was taken a decade before. I specially visited the village to see the most enchanting view of the hundreds of megalithic monuments errected at the western fringe of the village and also the Bedstead installed inside the Rahanki that could accomodate more than 30 persons to sleep on it. Construction work for pakka road was undergoing those days and I could see one or two megalith was unearthed and lying at the roadside. 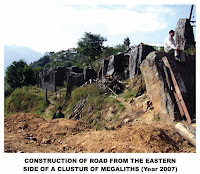 We were told that the megalith was removed in order to construct the road. It was indeed a very shocking moment for me to see the cultural remains of the past being droped out from the context without care and proper reason. I got deeply hurt again when I saw the ruin condition of a majestic bedstead that was lying inside the Rahangki ( Boy's Dormitory) into two pieces. 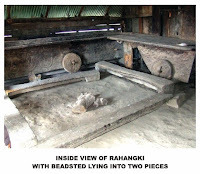 I was told that it was cut down at the time of rennovating the Rahangki. One of the native said " the soil was eroding and the condition was bad and we had to reduce the size of Rahangki. In order to move the rear wall about three or four feet inside we had to cut a piece of our beadstead". This felt me to realise that community conciousness and insitu conservation towards the preservation of material heritage is as much as necessary that we do conserve in a museum. Developing a sense of respect towards the cultural antiquities that has the historical values of the ancient past is as much needful in the tribal and rural villages as in the cases of protected monuments, sites of archaeological importance, cultural institutions, Museums etc. Still there are many of the tribal and rural villages where remenants of their ancient past are lying with them. It is not possible that all these items are brought, collected and preserved in a museum. There are many items that are sentimentally attached to the life and culture of the individual, family, clan, village or community concern that hardly motivated to be handed over to a museum. In such a cases insitu conservation plays an important role that applies not only the material conservation but also the community awarness programme that could generate a sense of love and respect with their own material culture of the past. Proper documentation with better exposition of the intangible values of the object under the curatorship of the people concern would be an effective medium of preserving the cultures of the past. This would indirectly benefit the community concern to develop the village into a living heritage and these resources of their ancient past would no doubt can become an important source of their earnings. The time is changing where people are anxious to visit the places and to spend the money where they can experience something different. It is right time that the museums should organise the programmes of culural expedition that could give the visitors a warm feeling to venture the cultural experiences and work as an interphase between the visitors and the cultural communities.